Bad email addresses, unsubscribers, and invalid domains can take a clean email list and contaminate it very fast. 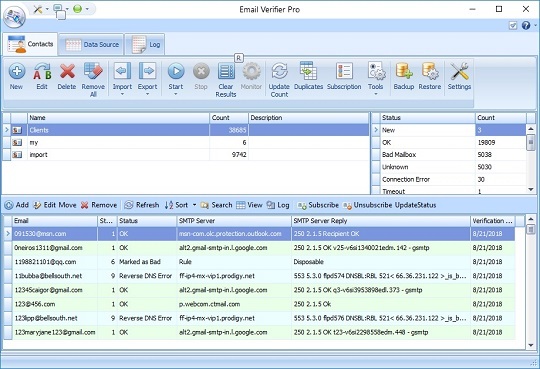 Fortunately, Email Verifier has all of the right tools within it to keep your contact list pure. In fact, it can work on a multitude of external databases, such as Microsoft Outlook, that may contain invalid email addresses that give an unrealistic view of how many valid recipients there are. When you can automatically clean your list easily, you know exactly how many people you are reaching. This prevents you from receiving a lot of bounced emails. Unfortunately, there are many ISPs that will block an IP if too many bounced emails come back to it. Using the right software to verify the validity of the email addresses you are sending to will keep this from happening to you. 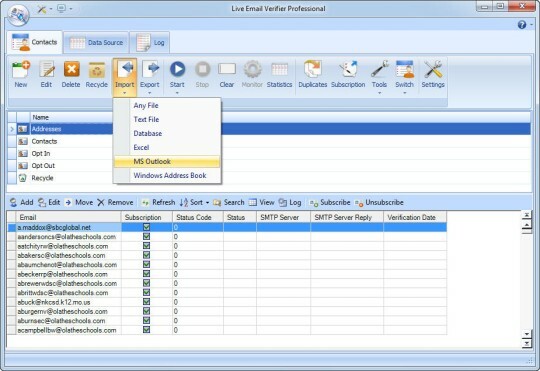 Through the Email Verifier software, invalid and non-existent email addresses are removed from the list. This can eliminate bounced messages and avoids the possibility of being blocked by the ISP mail server for sending too many emails to invalid addresses. It should be noted that the speed of email verifier depends upon list size, Internet speed, and Internet connection, but the process is generally fast in that lists can be loaded in a matter of seconds. This program is so automated that it can run overnight if it needs to without any supervision, which contributes to its popularity. It is up to you to set the rules for domains and it is as simple as choosing the specific domain and then specifying the rule you wish to use. This rule is simply a default status for the domain(s) that you select. Rather than just finding out whether an email address does or does not exist, an expanded email address status gives more information about the condition of that address. 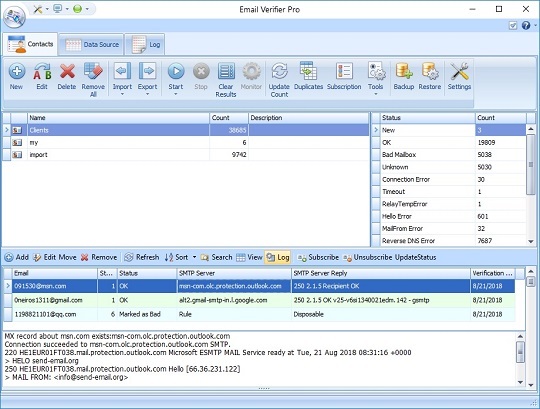 Email verifier is able to indicate whether or not there is a connection error or if the email address on a domain is simply non-existent. This enables you to make decisions regarding the addresses that may have issues, such as whether or not to check them at some point in the future. This email verification software is popular because it is far ahead of its competitors. Professionals are looking for ways to spend less time on organizing and cleaning lists and more time on serving the customers that respond. Because of the ability to process large lists of email addresses and quickly eliminate invalid addresses, it is much easier for the user to focus on what is important. The tools also make it easier for certain audiences to be targeted, which increases the conversion rate. This increase in conversion rate then translates into profits. Another reason why this is a popular program is the fact that contact lists are private. You do not have to use a 3rd party to upload recipients. You are the only one with access. This software is going to be of utmost assistance to you when you haven’t mailed out to your list for quite some time, you do not use a double opt-in process to ensure that subscribers typed in the right email address, or you have received your subscriber list from somewhere else and that makes you question its quality. Save bandwidth by reducing Internet traffic, which reduces operating costs due to an increased focus on a targeted audience. Verify email addresses within a database without having to import or export, saving a lot of time due to not having to perform manual work. Load large subscriber lists in seconds. Import email lists from DBase, paradox, Text, MySQL, and many more that may have additional information present in other custom fields that needs to be preserved. You can export such addresses containing custom fields as well. 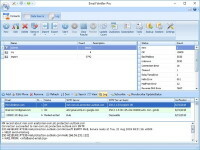 Quickly save email verification results to a text file, saving both good and bad emails to separate files if you wish. Customize how your information is organized with the ability to sort and filter addresses. To receive all of the professional features that Email Verifier offers, a one-time payment is all that is needed for you to enjoy the many benefits that the software has to offer for as long as you need it. The access to SMTP 25 port is an essential option. The user can install Email Verifier on Dedicated/VPS Windows server or use socks proxy server if they work under a firewall. A special Email Verifying Script can also be used. Pay attention to the speed that may vary. It depends on your Internet connection and your computer. Some antivirus and security software or firewall like Zone Alarm, Norton Antivirus and Panda can deny access to the Internet. Email Verifier is firstly to be allowed to connect to the Internet.